This second part of the series develops the plot further, taking Eragon on long journeys, training and bloody confrontations with the enemy, making allies along the way and being reunited with those left behind in the first part of this series. Perhaps overlong (over 600 pages), it's still an absorbing story with plenty of new characters - and a map! 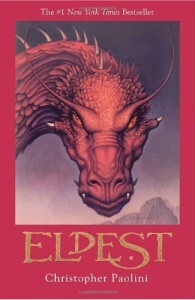 No point in reading it if you haven't read "Eragon" but it's a class fantasy series. Brisingr (the next part) next!